The history of the group has begun at February 2004 when creation of project which could unite musicians from different countries who play folk and pagan metal idea has originated from some musicians. After a series of negotiations the possibility of this idea realization has become evident. In spring 2004 musicians of different countries have begun a musical material recording. In September of 2004 the work on album has finished and the material was sent to Stygian Crypt productions for release. The 1st of December 2004 the first album “A Nordic Poem” was released by Stygian Crypt productions. 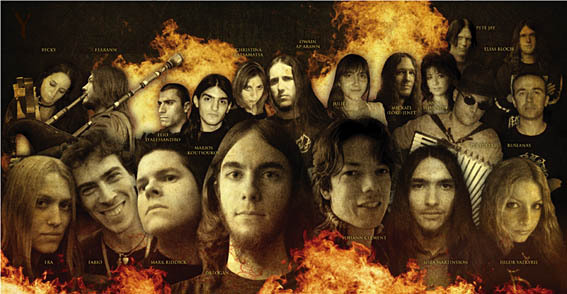 Later on the number of members of the band greatly increased up to 31 musicians from 8 countries and the second album under name By the Sword of my Father” was recorded by new line-up. It was issued at 1st of August 2006 by Stygian Crypt productions as well. The album has got a lot of exalted reviews in metal media and became warmly accepted by fans of folk viking metal. Less than a year the third album «Drakkars in the Mist» was ready and was released by Stygian Crypt productions. The date of release was 28th of May 2007. The album presents 17 tracks of folk viking metal which were performed and recorded by 30 musicians from 11 countries (Belgium, Croatia, Germany, Greece, Lithuania, North Italy, Norway, Russia, Spain, Sweden and USA). The musucuans from Morituri, Koziak, Thulr, Dol Amroth, Death Army, Vetter, Pagan Reign, Hordak, Yggdrasil, Nae´blis, The Soil Bleeds Black, Moonrot, Peordh took part in the recording. The lyrics of the album is devoted to Scandinavian and Ancient Greek mythology. 21th of January 2008 the fourth album “Father Of Victory” was issued by Stygian Crypt productions. It includes 12 tracks of folk viking metal performed by 20 musicians from 7 countries (England, France, Greece, Lithuania, Italy, Wales and USA). Members of such bands as Dol Amroth, The Soil Bleeds Black, Moonrot, Peordh, Oakhelm, Annwn, Frekkr took part in the recording. "Songs of Yore" is the 5th Folkearth album, entirely acoustic this time. The sixth album of Folkearth «Fatherland» was released in November 2008 by Stygian Crypt productions. Old members and newcomers who also play in bands as Folkodia, Frekkr, Excelsis, Sunuthar, Minhyriath, Hildr Valkyrie, Dol Amroth, The Soil Bleeds Black, Pantheist took part in recording of this album. 11 people of 7 countries as Greece, France, Switzerland, Lithuania, Italy, England and USA worked on this album. Now the band works on new album.